BACKGROUND: Presenteeism - or working while ill - is commonly seen as just an economic indicator of disease burden. Emerging evidence suggests it may best be conceptualised as a behaviour that has implications for the person and their employer, and one that can be clinically managed. OBJECTIVE: This article presents an overview of the phenomenon of presenteeism in the workforce and its clinical implications. It focuses on evidence relevant to the management of day-to-day, short term decisions on whether an individual should go into work while sick or take a day or more of work absence. This discussion is separate to the management of compensation and return to work issues. 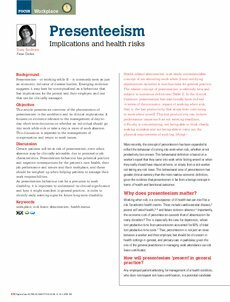 DISCUSSION: Certain patients will be at risk of presenteeism, even when absence may be clinically advisable, due to personal or job characteristics. Presenteeism behaviour has potential positive and negative consequences for the patient's own health, their job performance and tenure and their workplace, and these should be weighed up when helping patients to manage their work responsibilities.